This past week has been feeling like summer more than spring (holy smokes it’s already May!!) and I am loving, loving, loving it! 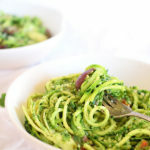 A combination of these warmer days and my body craving even more raw foods, plus the fact that I had a very large quantity of Persian cucumbers on hand, and my new-found love of mustard greens led me to create this recipe for Cucumber Noodles with Mustard Greens Pesto. As I’ve grown older and continued to learn more in the nutrition world, I’ve come to love experiencing a change in seasons and have become more aware of how those changing seasons effect my body. I’m amazed at how God orchestrates the entire system and how He instilled in our bodies and in the earth what and how we should eat. We’ve just got to relearn how to recognize those cues, right?. 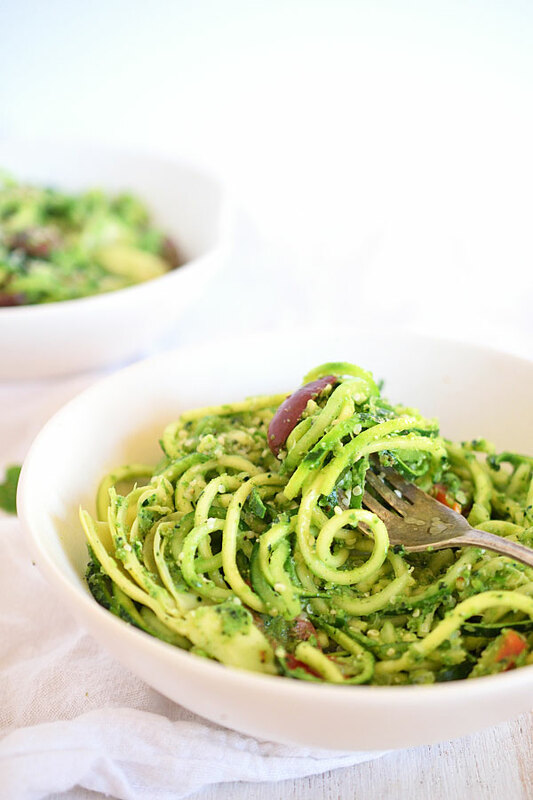 Cucumber noodles are the perfect way to add in more cleansing raw veggies! 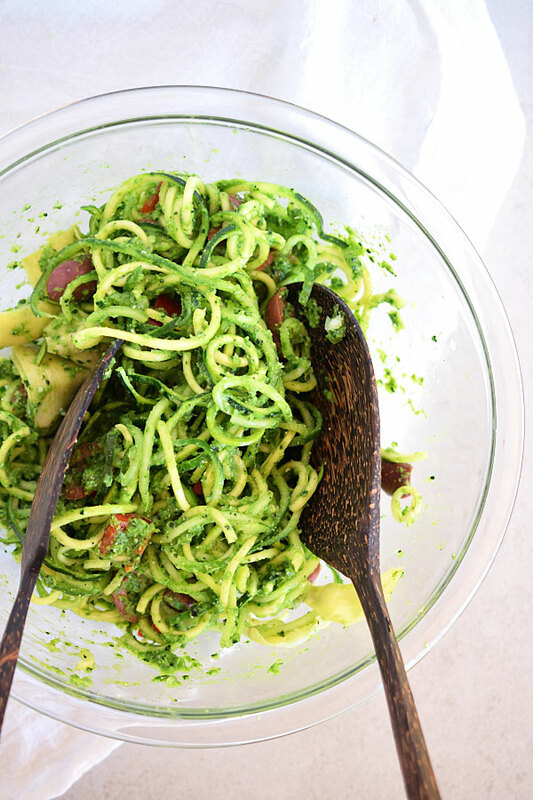 Not much simpler or more fun that spirilizing some cukes and marinating them in a vibrant sauce! Which brings me to mustard greens… Mustard greens have not been a part of my life until this year, and it’s about time! If you’ve ever had them you know how pungent they are, with an intense experience similar to that of eating horseradish. Not knowing their similarity, the first time I tried them I stuffed a large piece of a leaf into my mouth… lets just say a few moments later my sinuses were cleared… but I fell in love with the spicy, slightly bitter kick. You may be thinking, “if a small amount of the leaf could do all that, what am I getting myself into with this pesto? ?” Don’t you run away from these greens until you try this sauce! Something happens when blended with the other ingredients that transforms the intense, beautiful leafy vegetable into a zesty, awakening sauce. Perfectly balanced with salty, umami kalamata olives and subtley sweet, tender artichoke hearts. For the salad you can really use as much cucumbers as you want. Feel free to sub in zucchini or yellow squash for part of the cucumbers as well! Add whatever other chopped veggies you’d like, and however much. You can’t over due it with them. For a mild pesto use about equal parts mustard greens and kale. For a spicier pesto with a kick, only use mustard greens. Experiment with the amounts of lemon and mint that you like! Start with a small amount of both and continue to add to get to the flavor you love. A beautiful, bright detox salad perfect for spring. With cleansing vegetables and a vibrant sauce. 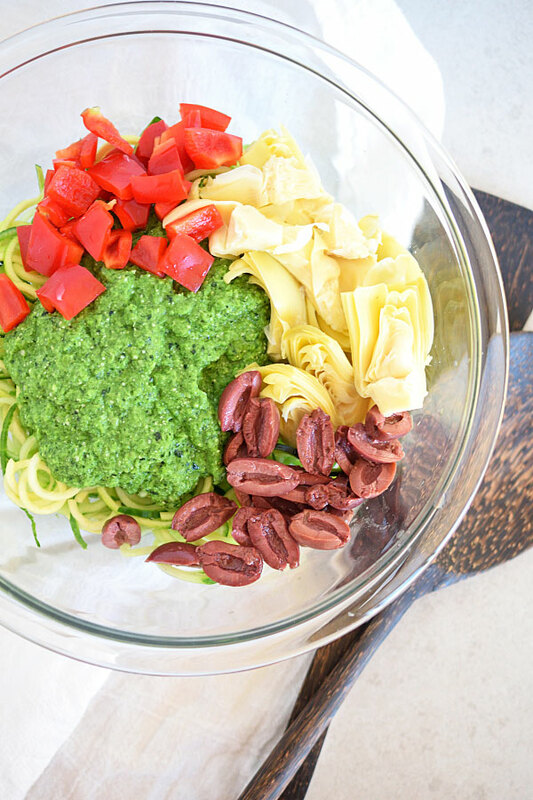 Raw, vegan, oil-free and so easy to throw together! Serve with your favorite main dish or add protein such as chickpeas. Additional add-ins: sundried or cherry tomatoes, chickpeas, snap peas, etc. Add as much of all ingredients for the salad to a large mixing bowl and toss. Set aside. Add the ingredients, except for the water, to a blender or food processor. Begin blending, adding water only as needed to help the ingredients blend well. Blend until you reach desired consistency - leave as chunky or blend to as smooth as you'd like. Taste. Adjust if needed. If too spicy, blend with extra kale or peas. Add more lemon if you want it more acidic. Pour onto your salad ingredients and mix until thorough coated. Serve with your favorite main dish or add chickpeas to make a main dish. Top with hemp seeds or desired topping. The cucumber noodles can be partially or fully swapped with zucchini noodles.